With 1.AKT begins “Chapter of the Egg”, the first half of the series. This also begins the first volume, titled Märchen, or “Fairytale” in English. During the prologue, a piece called by Kaoru Wada, a composer for Princess Tutu, plays. This piece is called “Introduction”, and is continually used for the prologues. The subtitle for 1.AKT is ～Der Nußknacker: Blumenwalzer～, or “The Nutcracker: Waltz of the Flowers”, referring to the aforementioned ballet, and a piece of music from Act II. This is a piece used later in the AKT. The first piece of music to note plays at the beginning of the episode, as Duck watches Mytho dance upon the lake. In the background plays “Dance of the Sugarplum Fairy” from Act II of The Nutcracker. The musical piece was composed by Peter Ilyich Tchaikovsky. Much of Tchaikovsky’s music from The Nutcracker as well as his music for Swan Lake are used in this series. When Duck sings, it’s to the tune of “Miniature Overture”, again from The Nutcracker. The musical piece plays as she opens the window, and continues on as she hurries to class. Upon arrival at the ballet classroom, Duck finds no one is there, no one except Senior Mytho. Once again, Tchaikovsky’s “Dance of the Sugarplum Fairy” plays for the sad-eyed dancer. If you’re looking through your classical ballet music CDs for the music heard during the scene when Pique and Lilie talk with Duck during practice about arriving early, you may wish to first add the Princess Tutu OST CD to your collection. It’s another piece by Kaoru Wada for the series, this one titled “Étude”. There are actually two “Étude” pieces (“Étude I” and “Étude II”) on the CD, and both contain the portion heard in the background here. The dance scene with Rue and the upper class is set to Tchaikovsky’s “No. 2 Waltz”, heard in Act I of Tchaikovsky’s own ballet, Swan Lake. I expect this also to be a recognized piece, at least the portion of it used here, as it’s a fairly popular piece. 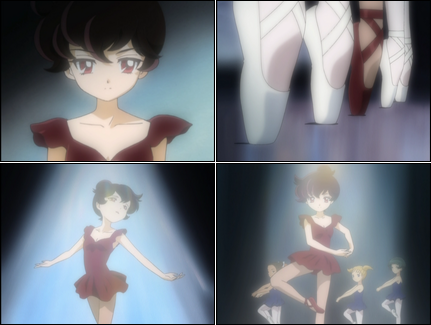 For the eyecatch, a piece from Tchaikovsky “March”, from The Nutcracker is used. Not much else to say here, as it’s a tiny portion used. The sound of “Miniature Overture” returns when Duck, Pique, and Lilie are in the changing room, and follows and Duck hurries out to the boys’ dorm. Continuing to the scene with Duck trying to convince herself that she has reason to be at the boy’s dorm is “Miniature Overture”. Really, I could have just combined this one with the paragraph above, but this gives me a reason to add in more screenshots. Isn’t Duck adorable? The music playing in the background while Duck ponders on Senior Mytho’s a difficult one for me. It could be an arrangement of “Miniature Overture”, which would follow as the theme music playing related to Duck and Mytho, but reworked to fit the sorrowful feel of the scene. Speaking of arrangements, an arrangement of “March” plays in the background when time freezes for Drossylmeyer’s visit. The original version would be too upbeat to fit the mood of the scene, but if one listens closely to the piece, it’s definitely “March” arranged. My all-time favorite piece of music plays when Mytho falls, and Duck realizes she’s Princess Tutu, transforming to save her prince. From The Nutcracker, Act II, it’s “Waltz of the Flowers”. This is the piece in the episode’s subtitle, as well as the name Princess Tutu calls out to create a flurry of flowers to catch Mytho. I admit it, I had trouble getting this collage in under 12 images. I meant to limit these to two or four images, and considered going with nine in a 3×3 at a smaller size, but managed to get by with six without having to shrink them any smaller. The episode concludes with Princess Tutu returning to her true form: a duck. In the background plays the “Miniature Overture” again, the theme for Duck. Finishing the music is “No. 28 Scene” from Swan Lake. This piece is heard during the preview of the next episode.